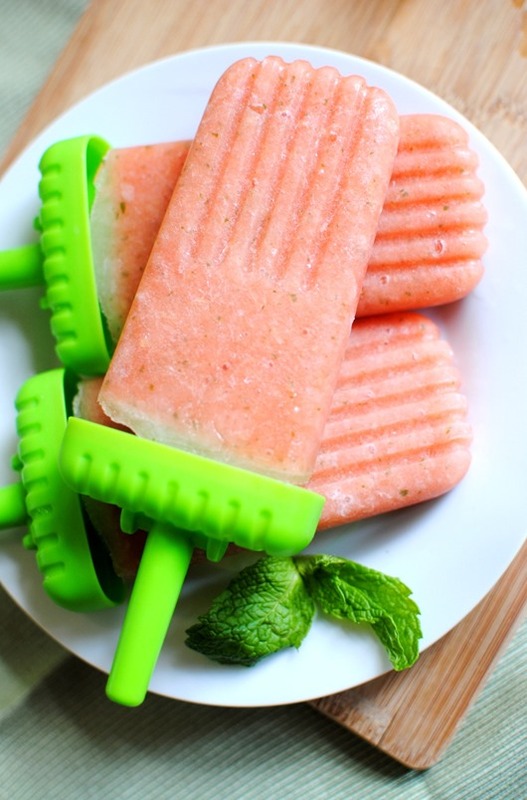 These Easy Watermelon Pineapple Popsicles are refreshing, delicious and only require three ingredients! 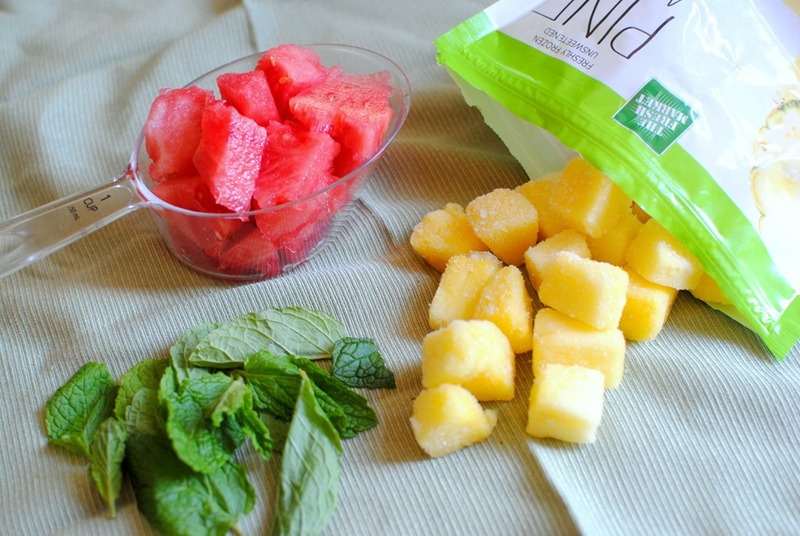 Blend watermelon, pineapple and fresh mint together for a summertime treat that’s healthy, perfectly cold and slightly sweet! If you’ve popped by PBF over the course of the past few weeks, you’re probably well aware of my ongoing love affair with watermelon. It’s borderline ridiculous because I truly feel like at this point in my life I could happily exist on watermelon alone. Watermelon is simply the perfect summertime food. So sweet, refreshing and absolutely delicious! I’m convinced there’s nothing better than cold watermelon when it feels like it’s 1,000 degrees outside (which it does, yet again, in Charlotte this week). Plus, watermelon is in season right now and always seems to be on sale at the grocery store, so I’ve been adding it to my grocery cart for months and eating my way through an embarrassing number of melons during my pregnancy. Don’t worry, there is a point to all of this random rambling about this fabulous fruit. I used watermelon as the base for some simple three-ingredient popsicles that I made over the weekend and Ryan and I could not get enough of them. They may be one of the easiest (and healthiest!) snack recipes I’ve shared on PBF! I simply blended watermelon, frozen pineapple and mint leaves together (there’s no need for additional liquid thanks the amount of juice that comes out of the melon! 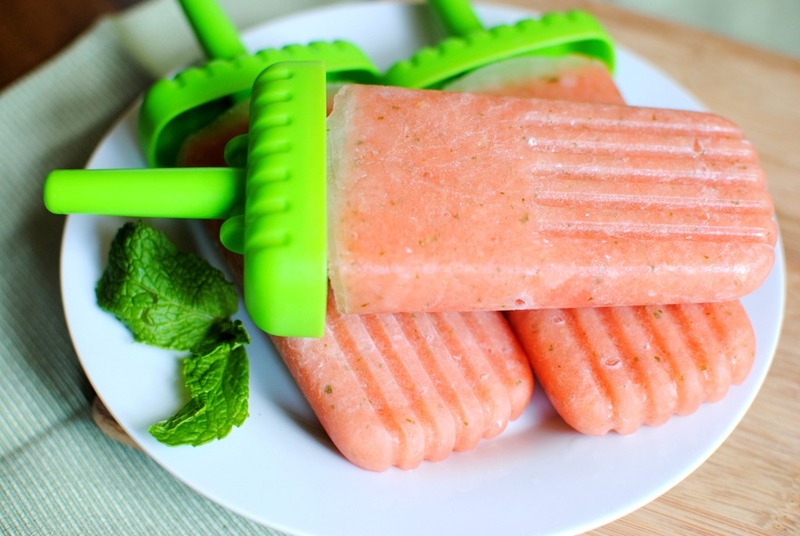 ), poured the mixture in popsicle molds and forced myself to wait until they were completely frozen to dig in. The result was a sweet, refreshing summertime treat that Ryan and I both absolutely adored. 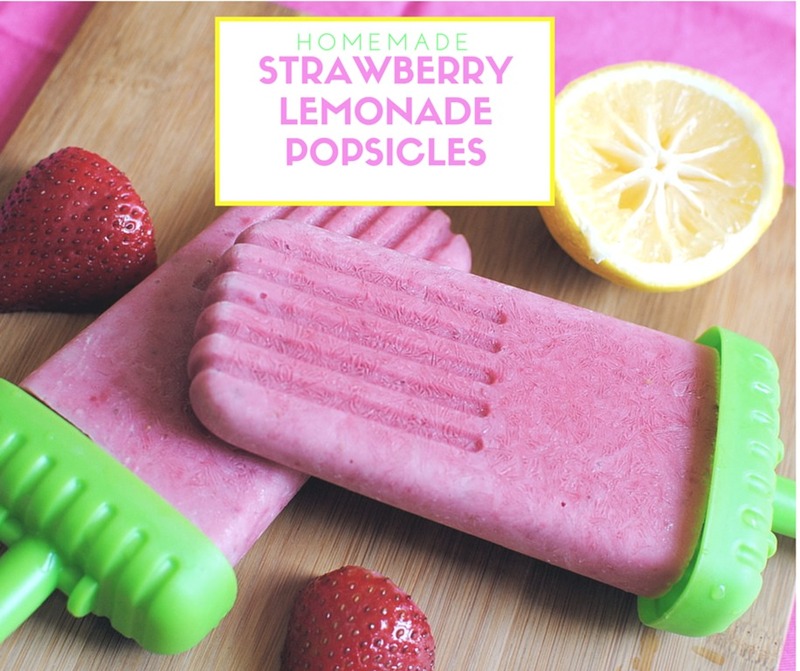 I am now on a mission to make watermelon popsicles with a variety of fruit flavors by swapping out the pineapple for everything from frozen strawberries or blackberries to mangos or peaches! Lots of possibilities! 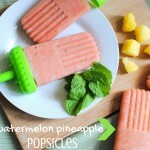 If you decide to give this recipe a try, I hope the popsicles cool you down and make you smile on a hot summer night! 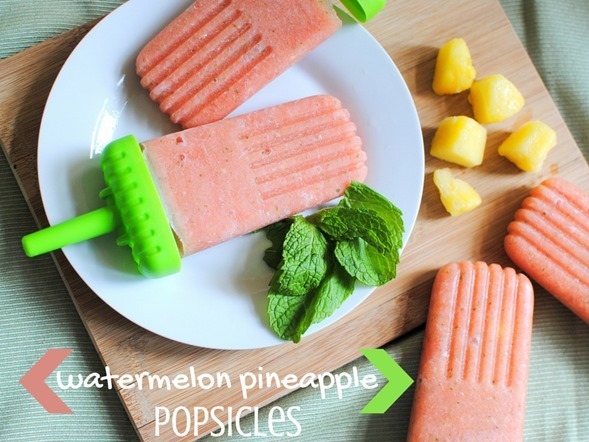 Watermelon and pineapple are definitely two of my favorite summer fruits so these Popsicles look so amazing and refreshing and easy to make! Ahhh these look so delicious, I wish I wasn’t allergic to pineapple… I think I’m going to try making these with mango! I think they would be awesome with mango or peaches!! Yay!! Hope you love them, Mama! Love you!!! Julie, what kind of popsicle molds do you use? I’ve bought a few different ones and none of them have worked very well. I use Tovolo molds that I bought off Amazon –> http://bit.ly/1fjeLJX Love them! 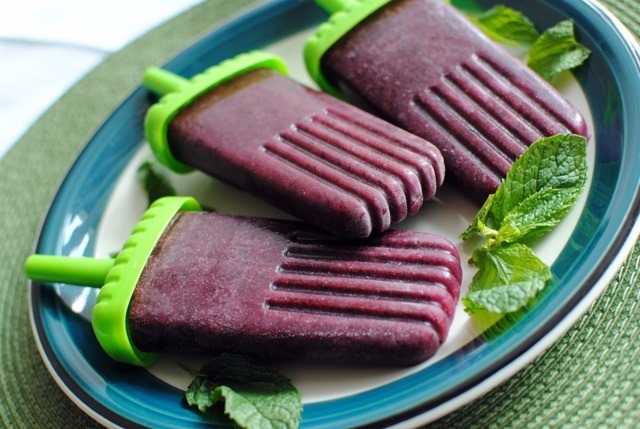 The popsicles come out easily and the size is perfect (not too big/not too small). Hope this helps! Ah so YUMMY! And totally refreshing… I need to invest in some popsicle forms. OMG! These sound so delicious, and I’m reading this when I’m hungry! I’m beginning to share your love/cravings for all things fruit – not that I need anymore fruit in my diet! It’s so hot and muggy in Ottawa that all I want is watermelon and frozen grapes! Om nom nom! I’ve been loving frozen grapes, too! So tasty! I love watermelon this time of year too! I have one in the fridge that I just need to slice up. Thanks for the ideas! These look AMAZING!! I need to make these asap!! I don’t even like popsicles but those look reall good! I have got to start making homemade popsicles!! I’ve been craving them like crazy! Yum! Ironically, I just experimented with watermelon this weekend too. I had gotten a huge watermelon and it ended up giving us three huge containers, and I ended up freezing the chunks since they were close to turning bad and I didn’t want to waste it all. I tried blending frozen watermelon, frozen strawberries, mint, and lime together with a few splashes of water and almond milk to get it all moving and then ate it with a spoon from a glass like ice cream. It turned out so well. Anyway, just a tip that watermelon actually freezes just fine! I have to try it with pineapple next time. Yum! 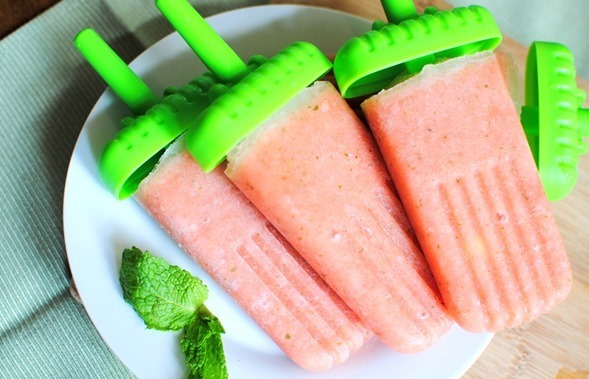 I am also obsessed with watermelon this summer so these are perfect! This sounds amazing and so refreshing! We just bought a watermelon yesterday and I am earmarking some of it for this recipe! Watermelon is the perfect summer food! These look fabulous! I love watermelon!! These look so perfect and refreshing!! Will definitely need to try them. I’m 35 weeks pregnant now and like you, can’t get enough of watermelon and other juicy fruit!! I’ve been on a popsicle frenzy lately, and now I want watermelon popsicles. That with the mint thrown in sounds so good and refreshing! 3 of my favorites in one recipe. These are totally getting made this weekend! Thanks!! I love your recipes so much! Another good one for the books! I broke my left mid-foot and my right ankle (yes, both feet/legs -bah!) a week ago, and have been trying to figure out how to make room in my freezer for the convenient freezer meals I’ll need (made by friends and others – my mobility is down to the bare minimum, due to casts, knee-tricycle, and crutches). The POINT is that JUST before reading this post, I was wondering what I’d do with the big bag of pineapple taking up space in my freezer, AND I have pre-cut watermelon in my fridge that I need to use asap, but haven’t been in the mood for watermelon on its own. And then, TA DA! Your post! I’m super majorly excited about this! Yayyyy! It’s kismet! My husband will be whipping these up for me, because he is the best. 🙂 Thanks Julie!